A credit default swap (CDS) is a financial swap agreement that the seller of the CDS will compensate the buyer in the event of a debt default (by the debtor) or other credit event. That is, the seller of the CDS insures the buyer against some reference asset defaulting. The buyer of the CDS makes a series of payments (the CDS "fee" or "spread") to the seller and, in exchange, may expect to receive a payoff if the asset defaults. In the event of default, the buyer of the CDS receives compensation (usually the face value of the loan), and the seller of the CDS takes possession of the defaulted loan or its market value in cash. However, anyone can purchase a CDS, even buyers who do not hold the loan instrument and who have no direct insurable interest in the loan (these are called "naked" CDSs). If there are more CDS contracts outstanding than bonds in existence, a protocol exists to hold a credit event auction. The payment received is often substantially less than the face value of the loan. Credit default swaps in their current form have existed since the early 1990s, and increased in use in the early 2000s. By the end of 2007, the outstanding CDS amount was $62.2 trillion, falling to $26.3 trillion by mid-year 2010 and reportedly $25.5 trillion in early 2012. CDSs are not traded on an exchange and there is no required reporting of transactions to a government agency. During the 2007–2010 financial crisis the lack of transparency in this large market became a concern to regulators as it could pose a systemic risk. In March 2010, the Depository Trust & Clearing Corporation (see Sources of Market Data) announced it would give regulators greater access to its credit default swaps database. Most CDSs are documented using standard forms drafted by the International Swaps and Derivatives Association (ISDA), although there are many variants. In addition to the basic, single-name swaps, there are basket default swaps (BDSs), index CDSs, funded CDSs (also called credit-linked notes), as well as loan-only credit default swaps (LCDS). In addition to corporations and governments, the reference entity can include a special purpose vehicle issuing asset-backed securities. Some claim that derivatives such as CDS are potentially dangerous in that they combine priority in bankruptcy with a lack of transparency. A CDS can be unsecured (without collateral) and be at higher risk for a default. Buyer purchased a CDS at time t0 and makes regular premium payments at times t1, t2, t3, and t4. If the associated credit instrument suffers no credit event, then the buyer continues paying premiums at t5, t6 and so on until the end of the contract at time tn. However, if the associated credit instrument suffered a credit event at t5, then the seller pays the buyer for the loss, and the buyer would cease paying premiums to the seller. A CDS is linked to a "reference entity" or "reference obligor", usually a corporation or government. The reference entity is not a party to the contract. The buyer makes regular premium payments to the seller, the premium amounts constituting the "spread" charged by the seller to insure against a credit event. If the reference entity defaults, the protection seller pays the buyer the par value of the bond in exchange for physical delivery of the bond, although settlement may also be by cash or auction. A default is often referred to as a "credit event" and includes such events as failure to pay, restructuring and bankruptcy, or even a drop in the borrower's credit rating. CDS contracts on sovereign obligations also usually include as credit events repudiation, moratorium and acceleration. Most CDSs are in the $10–$20 million range with maturities between one and 10 years. Five years is the most typical maturity. An investor or speculator may “buy protection” to hedge the risk of default on a bond or other debt instrument, regardless of whether such investor or speculator holds an interest in or bears any risk of loss relating to such bond or debt instrument. In this way, a CDS is similar to credit insurance, although CDS are not subject to regulations governing traditional insurance. Also, investors can buy and sell protection without owning debt of the reference entity. These "naked credit default swaps" allow traders to speculate on the creditworthiness of reference entities. CDSs can be used to create synthetic long and short positions in the reference entity. Naked CDS constitute most of the market in CDS. In addition, CDSs can also be used in capital structure arbitrage. A "credit default swap" (CDS) is a credit derivative contract between two counterparties. The buyer makes periodic payments to the seller, and in return receives a payoff if an underlying financial instrument defaults or experiences a similar credit event. The CDS may refer to a specified loan or bond obligation of a “reference entity”, usually a corporation or government. As an example, imagine that an investor buys a CDS from AAA-Bank, where the reference entity is Risky Corp. The investor—the buyer of protection—will make regular payments to AAA-Bank—the seller of protection. If Risky Corp defaults on its debt, the investor receives a one-time payment from AAA-Bank, and the CDS contract is terminated. If the investor actually owns Risky Corp's debt (i.e., is owed money by Risky Corp), a CDS can act as a hedge. But investors can also buy CDS contracts referencing Risky Corp debt without actually owning any Risky Corp debt. This may be done for speculative purposes, to bet against the solvency of Risky Corp in a gamble to make money, or to hedge investments in other companies whose fortunes are expected to be similar to those of Risky Corp (see Uses). AAA-Bank pays the investor the difference between the par value and the market price of a specified debt obligation (even if Risky Corp defaults there is usually some recovery, i.e., not all the investor's money is lost), which is known as cash settlement. The "spread" of a CDS is the annual amount the protection buyer must pay the protection seller over the length of the contract, expressed as a percentage of the notional amount. For example, if the CDS spread of Risky Corp is 50 basis points, or 0.5% (1 basis point = 0.01%), then an investor buying $10 million worth of protection from AAA-Bank must pay the bank $50,000. Payments are usually made on a quarterly basis, in arrears. These payments continue until either the CDS contract expires or Risky Corp defaults. All things being equal, at any given time, if the maturity of two credit default swaps is the same, then the CDS associated with a company with a higher CDS spread is considered more likely to default by the market, since a higher fee is being charged to protect against this happening. However, factors such as liquidity and estimated loss given default can affect the comparison. Credit spread rates and credit ratings of the underlying or reference obligations are considered among money managers to be the best indicators of the likelihood of sellers of CDSs having to perform under these contracts. CDS contracts have obvious similarities with insurance, because the buyer pays a premium and, in return, receives a sum of money if an adverse event occurs. However, there are also many differences, the most important being that an insurance contract provides an indemnity against the losses actually suffered by the policy holder on an asset in which it holds an insurable interest. By contrast a CDS provides an equal payout to all holders, calculated using an agreed, market-wide method. The holder does not need to own the underlying security and does not even have to suffer a loss from the default event. The CDS can therefore be used to speculate on debt objects. Hedge accounting may not be available under US Generally Accepted Accounting Principles (GAAP) unless the requirements of FAS 133 are met. In practice this rarely happens. to cancel the insurance contract the buyer can typically stop paying premiums, while for CDS the contract needs to be unwound. The buyer takes the risk that the seller may default. If AAA-Bank and Risky Corp. default simultaneously ("double default"), the buyer loses its protection against default by the reference entity. If AAA-Bank defaults but Risky Corp. does not, the buyer might need to replace the defaulted CDS at a higher cost. The seller takes the risk that the buyer may default on the contract, depriving the seller of the expected revenue stream. More important, a seller normally limits its risk by buying offsetting protection from another party — that is, it hedges its exposure. If the original buyer drops out, the seller squares its position by either unwinding the hedge transaction or by selling a new CDS to a third party. Depending on market conditions, that may be at a lower price than the original CDS and may therefore involve a loss to the seller. In the future, in the event that regulatory reforms require that CDS be traded and settled via a central exchange/clearing house, such as ICE TCC, there will no longer be 'counterparty risk', as the risk of the counterparty will be held with the central exchange/clearing house. As is true with other forms of over-the-counter derivative, CDS might involve liquidity risk. If one or both parties to a CDS contract must post collateral (which is common), there can be margin calls requiring the posting of additional collateral. The required collateral is agreed on by the parties when the CDS is first issued. This margin amount may vary over the life of the CDS contract, if the market price of the CDS contract changes, or the credit rating of one of the parties changes. Many CDS contracts even require payment of an upfront fee (composed of "reset to par" and an "initial coupon."). Another kind of risk for the seller of credit default swaps is jump risk or jump-to-default risk. A seller of a CDS could be collecting monthly premiums with little expectation that the reference entity may default. A default creates a sudden obligation on the protection sellers to pay millions, if not billions, of dollars to protection buyers. This risk is not present in other over-the-counter derivatives. Data about the credit default swaps market is available from three main sources. Data on an annual and semiannual basis is available from the International Swaps and Derivatives Association (ISDA) since 2001 and from the Bank for International Settlements (BIS) since 2004. The Depository Trust & Clearing Corporation (DTCC), through its global repository Trade Information Warehouse (TIW), provides weekly data but publicly available information goes back only one year. The numbers provided by each source do not always match because each provider uses different sampling methods. Daily, intraday and real time data is available from S&P Capital IQ through their acquisition of Credit Market Analysis in 2012. According to DTCC, the Trade Information Warehouse maintains the only "global electronic database for virtually all CDS contracts outstanding in the marketplace." The Office of the Comptroller of the Currency publishes quarterly credit derivative data about insured U.S commercial banks and trust companies. Credit default swaps can be used by investors for speculation, hedging and arbitrage. Credit default swaps allow investors to speculate on changes in CDS spreads of single names or of market indices such as the North American CDX index or the European iTraxx index. An investor might believe that an entity's CDS spreads are too high or too low, relative to the entity's bond yields, and attempt to profit from that view by entering into a trade, known as a basis trade, that combines a CDS with a cash bond and an interest rate swap. Finally, an investor might speculate on an entity's credit quality, since generally CDS spreads increase as credit-worthiness declines, and decline as credit-worthiness increases. The investor might therefore buy CDS protection on a company to speculate that it is about to default. Alternatively, the investor might sell protection if it thinks that the company's creditworthiness might improve. The investor selling the CDS is viewed as being "long" on the CDS and the credit, as if the investor owned the bond. In contrast, the investor who bought protection is "short" on the CDS and the underlying credit. Credit default swaps opened up important new avenues to speculators. Investors could go long on a bond without any upfront cost of buying a bond; all the investor need do was promise to pay in the event of default. Shorting a bond faced difficult practical problems, such that shorting was often not feasible; CDS made shorting credit possible and popular. Because the speculator in either case does not own the bond, its position is said to be a synthetic long or short position. For example, a hedge fund believes that Risky Corp will soon default on its debt. Therefore, it buys $10 million worth of CDS protection for two years from AAA-Bank, with Risky Corp as the reference entity, at a spread of 500 basis points (=5%) per annum. If Risky Corp does indeed default after, say, one year, then the hedge fund will have paid $500,000 to AAA-Bank, but then receives $10 million (assuming zero recovery rate, and that AAA-Bank has the liquidity to cover the loss), thereby making a profit. AAA-Bank, and its investors, will incur a $9.5 million loss minus recovery unless the bank has somehow offset the position before the default. However, if Risky Corp does not default, then the CDS contract runs for two years, and the hedge fund ends up paying $1 million, without any return, thereby making a loss. AAA-Bank, by selling protection, has made $1 million without any upfront investment. After 1 year, the market now considers Risky Corp more likely to default, so its CDS spread has widened from 500 to 1500 basis points. The hedge fund may choose to sell $10 million worth of protection for 1 year to AAA-Bank at this higher rate. Therefore, over the two years the hedge fund pays the bank 2 * 5% * $10 million = $1 million, but receives 1 * 15% * $10 million = $1.5 million, giving a total profit of $500,000. In another scenario, after one year the market now considers Risky much less likely to default, so its CDS spread has tightened from 500 to 250 basis points. Again, the hedge fund may choose to sell $10 million worth of protection for 1 year to AAA-Bank at this lower spread. Therefore, over the two years the hedge fund pays the bank 2 * 5% * $10 million = $1 million, but receives 1 * 2.5% * $10 million = $250,000, giving a total loss of $750,000. This loss is smaller than the $1 million loss that would have occurred if the second transaction had not been entered into. Transactions such as these do not even have to be entered into over the long-term. If Risky Corp's CDS spread had widened by just a couple of basis points over the course of one day, the hedge fund could have entered into an offsetting contract immediately and made a small profit over the life of the two CDS contracts. Credit default swaps are also used to structure synthetic collateralized debt obligations (CDOs). Instead of owning bonds or loans, a synthetic CDO gets credit exposure to a portfolio of fixed income assets without owning those assets through the use of CDS. CDOs are viewed as complex and opaque financial instruments. An example of a synthetic CDO is Abacus 2007-AC1, which is the subject of the civil suit for fraud brought by the SEC against Goldman Sachs in April 2010. Abacus is a synthetic CDO consisting of credit default swaps referencing a variety of mortgage-backed securities. In the examples above, the hedge fund did not own any debt of Risky Corp. A CDS in which the buyer does not own the underlying debt is referred to as a naked credit default swap, estimated to be up to 80% of the credit default swap market.[when?] There is currently a debate in the United States and Europe about whether speculative uses of credit default swaps should be banned. Legislation is under consideration by Congress as part of financial reform. Critics assert that naked CDSs should be banned, comparing them to buying fire insurance on your neighbor’s house, which creates a huge incentive for arson. Analogizing to the concept of insurable interest, critics say you should not be able to buy a CDS—insurance against default—when you do not own the bond. Short selling is also viewed as gambling and the CDS market as a casino. Another concern is the size of the CDS market. Because naked credit default swaps are synthetic, there is no limit to how many can be sold. The gross amount of CDSs far exceeds all “real” corporate bonds and loans outstanding. As a result, the risk of default is magnified leading to concerns about systemic risk. Financier George Soros called for an outright ban on naked credit default swaps, viewing them as “toxic” and allowing speculators to bet against and “bear raid” companies or countries. His concerns were echoed by several European politicians who, during the Greek Financial Crisis, accused naked CDS buyers of making the crisis worse. Despite these concerns, former United States Secretary of the Treasury Geithner and Commodity Futures Trading Commission Chairman Gensler are not in favor of an outright ban on naked credit default swaps. They prefer greater transparency and better capitalization requirements. These officials think that naked CDSs have a place in the market. Proponents of naked credit default swaps say that short selling in various forms, whether credit default swaps, options or futures, has the beneficial effect of increasing liquidity in the marketplace. That benefits hedging activities. Without speculators buying and selling naked CDSs, banks wanting to hedge might not find a ready seller of protection. Speculators also create a more competitive marketplace, keeping prices down for hedgers. A robust market in credit default swaps can also serve as a barometer to regulators and investors about the credit health of a company or country. Despite assertions that speculators are making the Greek crisis worse, Germany's market regulator BaFin found no proof supporting the claim. Some suggest that without credit default swaps, Greece’s borrowing costs would be higher. As of November 2011, the Greek bonds have a bond yield of 28%. A bill in the U.S. Congress proposed giving a public authority the power to limit the use of CDSs other than for hedging purposes, but the bill did not become law. Credit default swaps are often used to manage the risk of default that arises from holding debt. A bank, for example, may hedge its risk that a borrower may default on a loan by entering into a CDS contract as the buyer of protection. If the loan goes into default, the proceeds from the CDS contract cancel out the losses on the underlying debt. There are other ways to eliminate or reduce the risk of default. The bank could sell (that is, assign) the loan outright or bring in other banks as participants. However, these options may not meet the bank’s needs. Consent of the corporate borrower is often required. The bank may not want to incur the time and cost to find loan participants. If both the borrower and lender are well-known and the market (or even worse, the news media) learns that the bank is selling the loan, then the sale may be viewed as signaling a lack of trust in the borrower, which could severely damage the banker-client relationship. In addition, the bank simply may not want to sell or share the potential profits from the loan. By buying a credit default swap, the bank can lay off default risk while still keeping the loan in its portfolio. The downside to this hedge is that without default risk, a bank may have no motivation to actively monitor the loan and the counterparty has no relationship to the borrower. Another kind of hedge is against concentration risk. A bank’s risk management team may advise that the bank is overly concentrated with a particular borrower or industry. The bank can lay off some of this risk by buying a CDS. Because the borrower—the reference entity—is not a party to a credit default swap, entering into a CDS allows the bank to achieve its diversity objectives without impacting its loan portfolio or customer relations. Similarly, a bank selling a CDS can diversify its portfolio by gaining exposure to an industry in which the selling bank has no customer base. A bank buying protection can also use a CDS to free regulatory capital. By offloading a particular credit risk, a bank is not required to hold as much capital in reserve against the risk of default (traditionally 8% of the total loan under Basel I). This frees resources the bank can use to make other loans to the same key customer or to other borrowers. Hedging risk is not limited to banks as lenders. Holders of corporate bonds, such as banks, pension funds or insurance companies, may buy a CDS as a hedge for similar reasons. Pension fund example: A pension fund owns five-year bonds issued by Risky Corp with par value of $10 million. To manage the risk of losing money if Risky Corp defaults on its debt, the pension fund buys a CDS from Derivative Bank in a notional amount of $10 million. The CDS trades at 200 basis points (200 basis points = 2.00 percent). In return for this credit protection, the pension fund pays 2% of $10 million ($200,000) per annum in quarterly installments of $50,000 to Derivative Bank. If Risky Corporation does not default on its bond payments, the pension fund makes quarterly payments to Derivative Bank for 5 years and receives its $10 million back after five years from Risky Corp. Though the protection payments totaling $1 million reduce investment returns for the pension fund, its risk of loss due to Risky Corp defaulting on the bond is eliminated. If Risky Corporation defaults on its debt three years into the CDS contract, the pension fund would stop paying the quarterly premium, and Derivative Bank would ensure that the pension fund is refunded for its loss of $10 million minus recovery (either by physical or cash settlement — see Settlement below). The pension fund still loses the $600,000 it has paid over three years, but without the CDS contract it would have lost the entire $10 million minus recovery. In addition to financial institutions, large suppliers can use a credit default swap on a public bond issue or a basket of similar risks as a proxy for its own credit risk exposure on receivables. Although credit default swaps have been highly criticized for their role in the recent financial crisis, most observers conclude that using credit default swaps as a hedging device has a useful purpose. Capital Structure Arbitrage is an example of an arbitrage strategy that uses CDS transactions. This technique relies on the fact that a company's stock price and its CDS spread should exhibit negative correlation; i.e., if the outlook for a company improves then its share price should go up and its CDS spread should tighten, since it is less likely to default on its debt. However, if its outlook worsens then its CDS spread should widen and its stock price should fall. Techniques reliant on this are known as capital structure arbitrage because they exploit market inefficiencies between different parts of the same company's capital structure; i.e., mis-pricings between a company's debt and equity. An arbitrageur attempts to exploit the spread between a company's CDS and its equity in certain situations. For example, if a company has announced some bad news and its share price has dropped by 25%, but its CDS spread has remained unchanged, then an investor might expect the CDS spread to increase relative to the share price. Therefore, a basic strategy would be to go long on the CDS spread (by buying CDS protection) while simultaneously hedging oneself by buying the underlying stock. This technique would benefit in the event of the CDS spread widening relative to the equity price, but would lose money if the company's CDS spread tightened relative to its equity. An interesting situation in which the inverse correlation between a company's stock price and CDS spread breaks down is during a Leveraged buyout (LBO). Frequently this leads to the company's CDS spread widening due to the extra debt that will soon be put on the company's books, but also an increase in its share price, since buyers of a company usually end up paying a premium. Existence of buyers constrained from buying exotic derivatives. The difference between CDS spreads and asset swap spreads is called the basis and should theoretically be close to zero. Basis trades can aim to exploit any differences to make risk-free profit. Forms of credit default swaps had been in existence from at least the early 1990s, with early trades carried out by Bankers Trust in 1991. J.P. Morgan & Co. is widely credited with creating the modern credit default swap in 1994. In that instance, J.P. Morgan had extended a $4.8 billion credit line to Exxon, which faced the threat of $5 billion in punitive damages for the Exxon Valdez oil spill. A team of J.P. Morgan bankers led by Blythe Masters then sold the credit risk from the credit line to the European Bank of Reconstruction and Development in order to cut the reserves that J.P. Morgan was required to hold against Exxon's default, thus improving its own balance sheet. In 1997, JPMorgan developed a proprietary product called BISTRO (Broad Index Securitized Trust Offering) that used CDS to clean up a bank’s balance sheet. The advantage of BISTRO was that it used securitization to split up the credit risk into little pieces that smaller investors found more digestible, since most investors lacked EBRD's capability to accept $4.8 billion in credit risk all at once. BISTRO was the first example of what later became known as synthetic collateralized debt obligations (CDOs). There were two Bistros in 1997 for approximately $10 billion each. Mindful of the concentration of default risk as one of the causes of the S&L crisis, regulators initially found CDS's ability to disperse default risk attractive. In 2000, credit default swaps became largely exempt from regulation by both the U.S. Securities and Exchange Commission (SEC) and the Commodity Futures Trading Commission (CFTC). The Commodity Futures Modernization Act of 2000, which was also responsible for the Enron loophole, specifically stated that CDSs are neither futures nor securities and so are outside the remit of the SEC and CFTC. At first, banks were the dominant players in the market, as CDS were primarily used to hedge risk in connection with its lending activities. Banks also saw an opportunity to free up regulatory capital. By March 1998, the global market for CDS was estimated at about $300 billion, with JP Morgan alone accounting for about $50 billion of this. The high market share enjoyed by the banks was soon eroded as more and more asset managers and hedge funds saw trading opportunities in credit default swaps. By 2002, investors as speculators, rather than banks as hedgers, dominated the market. National banks in the USA used credit default swaps as early as 1996. In that year, the Office of the Comptroller of the Currency measured the size of the market as tens of billions of dollars. Six years later, by year-end 2002, the outstanding amount was over $2 trillion. Although speculators fueled the exponential growth, other factors also played a part. An extended market could not emerge until 1999, when ISDA standardized the documentation for credit default swaps. Also, the 1997 Asian Financial Crisis spurred a market for CDS in emerging market sovereign debt. In addition, in 2004, index trading began on a large scale and grew rapidly. The market size for Credit Default Swaps more than doubled in size each year from $3.7 trillion in 2003. By the end of 2007, the CDS market had a notional value of $62.2 trillion. But notional amount fell during 2008 as a result of dealer "portfolio compression" efforts (replacing offsetting redundant contracts), and by the end of 2008 notional amount outstanding had fallen 38 percent to $38.6 trillion. Explosive growth was not without operational headaches. On September 15, 2005, the New York Fed summoned 14 banks to its offices. Billions of dollars of CDS were traded daily but the record keeping was more than two weeks behind. This created severe risk management issues, as counterparties were in legal and financial limbo. U.K. authorities expressed the same concerns. Composition of the United States 15.5 trillion US dollar CDS market at the end of 2008 Q2. Green tints show Prime asset CDSs, reddish tints show sub-prime asset CDSs. Numbers followed by "Y" indicate years until maturity. Proportion of CDSs nominals (lower left) held by United States banks compared to all derivatives, in 2008Q2. The black disc represents the 2008 public debt. Since default is a relatively rare occurrence (historically around 0.2% of investment grade companies default in any one year), in most CDS contracts the only payments are the premium payments from buyer to seller. Thus, although the above figures for outstanding notionals are very large, in the absence of default the net cash flows are only a small fraction of this total: for a 100 bp = 1% spread, the annual cash flows are only 1% of the notional amount. The market for Credit Default Swaps attracted considerable concern from regulators after a number of large scale incidents in 2008, starting with the collapse of Bear Stearns. In the days and weeks leading up to Bear's collapse, the bank's CDS spread widened dramatically, indicating a surge of buyers taking out protection on the bank. It has been suggested that this widening was responsible for the perception that Bear Stearns was vulnerable, and therefore restricted its access to wholesale capital, which eventually led to its forced sale to JP Morgan in March. An alternative view is that this surge in CDS protection buyers was a symptom rather than a cause of Bear's collapse; i.e., investors saw that Bear was in trouble, and sought to hedge any naked exposure to the bank, or speculate on its collapse. In September, the bankruptcy of Lehman Brothers caused a total close to $400 billion to become payable to the buyers of CDS protection referenced against the insolvent bank. However the net amount that changed hands was around $7.2 billion. (The given citation does not support either of the two purported facts stated in previous two sentences.). This difference is due to the process of 'netting'. Market participants co-operated so that CDS sellers were allowed to deduct from their payouts the inbound funds due to them from their hedging positions. Dealers generally attempt to remain risk-neutral, so that their losses and gains after big events offset each other. Also in September American International Group (AIG) required  a $85 billion federal loan because it had been excessively selling CDS protection without hedging against the possibility that the reference entities might decline in value, which exposed the insurance giant to potential losses over $100 billion. The CDS on Lehman were settled smoothly, as was largely the case for the other 11 credit events occurring in 2008 that triggered payouts. And while it is arguable that other incidents would have been as bad or worse if less efficient instruments than CDS had been used for speculation and insurance purposes, the closing months of 2008 saw regulators working hard to reduce the risk involved in CDS transactions. In 2008 there was no centralized exchange or clearing house for CDS transactions; they were all done over the counter (OTC). This led to recent calls for the market to open up in terms of transparency and regulation. In 2009 the U.S. Securities and Exchange Commission granted an exemption for Intercontinental Exchange to begin guaranteeing credit-default swaps. The SEC exemption represented the last regulatory approval needed by Atlanta-based Intercontinental. A derivatives analyst at Morgan Stanley, one of the backers for IntercontinentalExchange's subsidiary, ICE Trust in New York, launched in 2008, claimed that the "clearinghouse, and changes to the contracts to standardize them, will probably boost activity". IntercontinentalExchange's subsidiary, ICE Trust's larger competitor, CME Group Inc., hasn’t received an SEC exemption, and agency spokesman John Nester said he didn’t know when a decision would be made. The early months of 2009 saw several fundamental changes to the way CDSs operate, resulting from concerns over the instruments' safety after the events of the previous year. According to Deutsche Bank managing director Athanassios Diplas "the industry pushed through 10 years worth of changes in just a few months". By late 2008 processes had been introduced allowing CDSs that offset each other to be cancelled. Along with termination of contracts that have recently paid out such as those based on Lehmans, this had by March reduced the face value of the market down to an estimated $30 trillion. 1. The introduction of central clearing houses, one for the US and one for Europe. A clearing house acts as the central counterparty to both sides of a CDS transaction, thereby reducing the counterparty risk that both buyer and seller face. 2. The international standardization of CDS contracts, to prevent legal disputes in ambiguous cases where what the payout should be is unclear. In the U.S., central clearing operations began in March 2009, operated by InterContinental Exchange (ICE). A key competitor also interested in entering the CDS clearing sector is CME Group. By the end of 2009, banks had reclaimed much of their market share; hedge funds had largely retreated from the market after the crises. According to an estimate by the Banque de France, by late 2009 the bank JP Morgan alone now had about 30% of the global CDS market. The SEC's approval for ICE Futures' request to be exempted from rules that would prevent it clearing CDSs was the third government action granted to Intercontinental in one week. On March 3, its proposed acquisition of Clearing Corp., a Chicago clearinghouse owned by eight of the largest dealers in the credit-default swap market, was approved by the Federal Trade Commission and the Justice Department. On March 5, 2009, the Federal Reserve Board, which oversees the clearinghouse, granted a request for ICE to begin clearing. Clearing Corp. shareholders including JPMorgan Chase & Co., Goldman Sachs Group Inc. and UBS AG, received $39 million in cash from Intercontinental in the acquisition, as well as the Clearing Corp.’s cash on hand and a 50–50 profit-sharing agreement with Intercontinental on the revenue generated from processing the swaps. Other proposals to clear credit-default swaps have been made by NYSE Euronext, Eurex AG and LCH.Clearnet Ltd. Only the NYSE effort is available now for clearing after starting on Dec. 22. As of Jan. 30, no swaps had been cleared by the NYSE’s London- based derivatives exchange, according to NYSE Chief Executive Officer Duncan Niederauer. Members of the Intercontinental clearinghouse ICE Trust (now ICE Clear Credit) in March 2009 would have to have a net worth of at least $5 billion and a credit rating of A or better to clear their credit-default swap trades. Intercontinental said in the statement today that all market participants such as hedge funds, banks or other institutions are open to become members of the clearinghouse as long as they meet these requirements. A clearinghouse acts as the buyer to every seller and seller to every buyer, reducing the risk of counterparty defaulting on a transaction. In the over-the-counter market, where credit- default swaps are currently traded, participants are exposed to each other in case of a default. A clearinghouse also provides one location for regulators to view traders’ positions and prices. In April 2012, hedge fund insiders became aware that the market in credit default swaps was possibly being affected by the activities of Bruno Iksil, a trader for J.P. Morgan Chase & Co., referred to as "the London whale" in reference to the huge positions he was taking. Heavy opposing bets to his positions are known to have been made by traders, including another branch of J.P. Morgan, who purchased the derivatives offered by J.P. Morgan in such high volume. Major losses, $2 billion, were reported by the firm in May 2012 in relationship to these trades. The disclosure, which resulted in headlines in the media, did not disclose the exact nature of the trading involved, which remains in progress. The item traded, possibly related to CDX IG 9, an index based on the default risk of major U.S. corporations, has been described as a "derivative of a derivative". A CDS contract is typically documented under a confirmation referencing the credit derivatives definitions as published by the International Swaps and Derivatives Association. The confirmation typically specifies a reference entity, a corporation or sovereign that generally, although not always, has debt outstanding, and a reference obligation, usually an unsubordinated corporate bond or government bond. The period over which default protection extends is defined by the contract effective date and scheduled termination date. The confirmation also specifies a calculation agent who is responsible for making determinations as to successors and substitute reference obligations (for example necessary if the original reference obligation was a loan that is repaid before the expiry of the contract), and for performing various calculation and administrative functions in connection with the transaction. By market convention, in contracts between CDS dealers and end-users, the dealer is generally the calculation agent, and in contracts between CDS dealers, the protection seller is generally the calculation agent. It is not the responsibility of the calculation agent to determine whether or not a credit event has occurred but rather a matter of fact that, pursuant to the terms of typical contracts, must be supported by publicly available information delivered along with a credit event notice. Typical CDS contracts do not provide an internal mechanism for challenging the occurrence or non-occurrence of a credit event and rather leave the matter to the courts if necessary, though actual instances of specific events being disputed are relatively rare. CDS confirmations also specify the credit events that will give rise to payment obligations by the protection seller and delivery obligations by the protection buyer. Typical credit events include bankruptcy with respect to the reference entity and failure to pay with respect to its direct or guaranteed bond or loan debt. CDS written on North American investment grade corporate reference entities, European corporate reference entities and sovereigns generally also include restructuring as a credit event, whereas trades referencing North American high-yield corporate reference entities typically do not. Finally, standard CDS contracts specify deliverable obligation characteristics that limit the range of obligations that a protection buyer may deliver upon a credit event. Trading conventions for deliverable obligation characteristics vary for different markets and CDS contract types. Typical limitations include that deliverable debt be a bond or loan, that it have a maximum maturity of 30 years, that it not be subordinated, that it not be subject to transfer restrictions (other than Rule 144A), that it be of a standard currency and that it not be subject to some contingency before becoming due. The premium payments are generally quarterly, with maturity dates (and likewise premium payment dates) falling on March 20, June 20, September 20, and December 20. Due to the proximity to the IMM dates, which fall on the third Wednesday of these months, these CDS maturity dates are also referred to as "IMM dates". 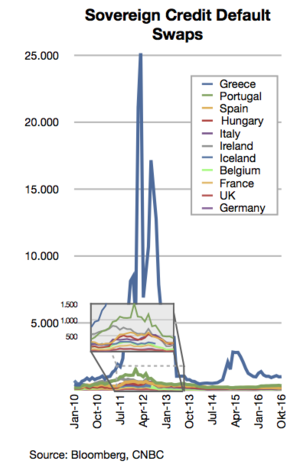 Sovereign credit default swap prices of selected European countries (2010-2011). The left axis is basis points, or 100ths of a percent; a level of 1,000 means it costs $1 million per year to protect $10 million of debt for five years. The European sovereign debt crisis resulted from a combination of complex factors, including the globalisation of finance; easy credit conditions during the 2002–2008 period that encouraged high-risk lending and borrowing practices; the 2007–2012 global financial crisis; international trade imbalances; real-estate bubbles that have since burst; the 2008–2012 global recession; fiscal policy choices related to government revenues and expenses; and approaches used by nations to bail out troubled banking industries and private bondholders, assuming private debt burdens or socialising losses. The Credit default swap market also reveals the beginning of the sovereign crisis. Since December 1, 2011 the European Parliament has banned naked Credit default swap (CDS) on the debt for sovereign nations. The definition of restructuring is quite technical but is essentially intended to respond to circumstances where a reference entity, as a result of the deterioration of its credit, negotiates changes in the terms in its debt with its creditors as an alternative to formal insolvency proceedings (i.e. the debt is restructured). During the 2012 Greek sovereign debt crisis, one important issue was whether the restructuring would trigger Credit default swap (CDS) payments. European Central Bank and the International Monetary Fund negotiators avoided these triggers as they could have jeopardized the stability of major European banks who had been protection writers. An alternative could have been to create new CDS which clearly would pay in the event of debt restructuring. The market would have paid the spread between these and old (potentially more ambiguous) CDS. This practice is far more typical in jurisdictions that do not provide protective status to insolvent debtors similar to that provided by Chapter 11 of the United States Bankruptcy Code. In particular, concerns arising out of Conseco's restructuring in 2000 led to the credit event's removal from North American high yield trades. As described in an earlier section, if a credit event occurs then CDS contracts can either be physically settled or cash settled. Physical settlement: The protection seller pays the buyer par value, and in return takes delivery of a debt obligation of the reference entity. For example, a hedge fund has bought $5 million worth of protection from a bank on the senior debt of a company. In the event of a default, the bank pays the hedge fund $5 million cash, and the hedge fund must deliver $5 million face value of senior debt of the company (typically bonds or loans, which are typically worth very little given that the company is in default). Cash settlement: The protection seller pays the buyer the difference between par value and the market price of a debt obligation of the reference entity. For example, a hedge fund has bought $5 million worth of protection from a bank on the senior debt of a company. This company has now defaulted, and its senior bonds are now trading at 25 (i.e., 25 cents on the dollar) since the market believes that senior bondholders will receive 25% of the money they are owed once the company is wound up. Therefore, the bank must pay the hedge fund $5 million × (100% − 25%) = $3.75 million. The development and growth of the CDS market has meant that on many companies there is now a much larger outstanding notional of CDS contracts than the outstanding notional value of its debt obligations. (This is because many parties made CDS contracts for speculative purposes, without actually owning any debt that they wanted to insure against default.) For example, at the time it filed for bankruptcy on September 14, 2008, Lehman Brothers had approximately $155 billion of outstanding debt but around $400 billion notional value of CDS contracts had been written that referenced this debt. Clearly not all of these contracts could be physically settled, since there was not enough outstanding Lehman Brothers debt to fulfill all of the contracts, demonstrating the necessity for cash settled CDS trades. The trade confirmation produced when a CDS is traded states whether the contract is to be physically or cash settled. When a credit event occurs on a major company on which a lot of CDS contracts are written, an auction (also known as a credit-fixing event) may be held to facilitate settlement of a large number of contracts at once, at a fixed cash settlement price. During the auction process participating dealers (e.g., the big investment banks) submit prices at which they would buy and sell the reference entity's debt obligations, as well as net requests for physical settlement against par. A second stage Dutch auction is held following the publication of the initial midpoint of the dealer markets and what is the net open interest to deliver or be delivered actual bonds or loans. The final clearing point of this auction sets the final price for cash settlement of all CDS contracts and all physical settlement requests as well as matched limit offers resulting from the auction are actually settled. According to the International Swaps and Derivatives Association (ISDA), who organised them, auctions have recently proved an effective way of settling the very large volume of outstanding CDS contracts written on companies such as Lehman Brothers and Washington Mutual. Commentator Felix Salmon, however, has questioned in advance ISDA's ability to structure an auction, as defined to date, to set compensation associated with a 2012 bond swap in Greek government debt. For its part, ISDA in the leadup to a 50% or greater "haircut" for Greek bondholders, issued an opinion that the bond swap would not constitute a default event. Below is a list of the auctions that have been held since 2005. There are two competing theories usually advanced for the pricing of credit default swaps. The first, referred to herein as the 'probability model', takes the present value of a series of cashflows weighted by their probability of non-default. This method suggests that credit default swaps should trade at a considerably lower spread than corporate bonds. The second model, proposed by Darrell Duffie, but also by John Hull and Alan White, uses a no-arbitrage approach. a default occurs on the first, second, third or fourth payment date. To price the CDS we now need to assign probabilities to the five possible outcomes, then calculate the present value of the payoff for each outcome. The present value of the CDS is then simply the present value of the five payoffs multiplied by their probability of occurring. is made, shown in blue. At either side of the diagram are the cashflows up to that point in time with premium payments in blue and default payments in red. If the contract is terminated the square is shown with solid shading.
. The riskier the reference entity the greater the spread and the more rapidly the survival probability decays with time. In the "no-arbitrage" model proposed by both Duffie, and Hull-White, it is assumed that there is no risk free arbitrage. Duffie uses the LIBOR as the risk free rate, whereas Hull and White use US Treasuries as the risk free rate. Both analyses make simplifying assumptions (such as the assumption that there is zero cost of unwinding the fixed leg of the swap on default), which may invalidate the no-arbitrage assumption. However the Duffie approach is frequently used by the market to determine theoretical prices. Under the Duffie construct, the price of a credit default swap can also be derived by calculating the asset swap spread of a bond. If a bond has a spread of 100, and the swap spread is 70 basis points, then a CDS contract should trade at 30. However, there are sometimes technical reasons why this will not be the case, and this may or may not present an arbitrage opportunity for the canny investor. The difference between the theoretical model and the actual price of a credit default swap is known as the basis. Critics of the huge credit default swap market have claimed that it has been allowed to become too large without proper regulation and that, because all contracts are privately negotiated, the market has no transparency. Furthermore, there have been claims that CDSs exacerbated the 2008 global financial crisis by hastening the demise of companies such as Lehman Brothers and AIG. In the case of Lehman Brothers, it is claimed that the widening of the bank's CDS spread reduced confidence in the bank and ultimately gave it further problems that it was not able to overcome. However, proponents of the CDS market argue that this confuses cause and effect; CDS spreads simply reflected the reality that the company was in serious trouble. Furthermore, they claim that the CDS market allowed investors who had counterparty risk with Lehman Brothers to reduce their exposure in the case of their default. Credit default swaps have also faced criticism that they contributed to a breakdown in negotiations during the 2009 General Motors Chapter 11 reorganization, because certain bondholders might benefit from the credit event of a GM bankruptcy due to their holding of CDSs. Critics speculate that these creditors had an incentive to push for the company to enter bankruptcy protection. Due to a lack of transparency, there was no way to identify the protection buyers and protection writers. It was also feared at the time of Lehman's bankruptcy that the $400 billion notional of CDS protection which had been written on the bank could lead to a net payout of $366 billion from protection sellers to buyers (given the cash-settlement auction settled at a final price of 8.625%) and that these large payouts could lead to further bankruptcies of firms without enough cash to settle their contracts. However, industry estimates after the auction suggest that net cashflows were only in the region of $7 billion. because many parties held offsetting positions. Furthermore, CDS deals are marked-to-market frequently. This would have led to margin calls from buyers to sellers as Lehman's CDS spread widened, reducing the net cashflows on the days after the auction. Senior bankers have argued that not only has the CDS market functioned remarkably well during the financial crisis; that CDS contracts have been acting to distribute risk just as was intended; and that it is not CDSs themselves that need further regulation but the parties who trade them. Some general criticism of financial derivatives is also relevant to credit derivatives. Warren Buffett famously described derivatives bought speculatively as "financial weapons of mass destruction." In Berkshire Hathaway's annual report to shareholders in 2002, he said, "Unless derivatives contracts are collateralized or guaranteed, their ultimate value also depends on the creditworthiness of the counterparties to them. In the meantime, though, before a contract is settled, the counterparties record profits and losses—often huge in amount—in their current earnings statements without so much as a penny changing hands. The range of derivatives contracts is limited only by the imagination of man (or sometimes, so it seems, madmen)." To hedge the counterparty risk of entering a CDS transaction, one practice is to buy CDS protection on one's counterparty. The positions are marked-to-market daily and collateral pass from buyer to seller or vice versa to protect both parties against counterparty default, but money does not always change hands due to the offset of gains and losses by those who had both bought and sold protection. Depository Trust & Clearing Corporation, the clearinghouse for the majority of trades in the US over-the-counter market, stated in October 2008 that once offsetting trades were considered, only an estimated $6 billion would change hands on October 21, during the settlement of the CDS contracts issued on Lehman Brothers' debt, which amounted to somewhere between $150 to $360 billion. Despite Buffett's criticism on derivatives, in October 2008 Berkshire Hathaway revealed to regulators that it has entered into at least $4.85 billion in derivative transactions. Buffett stated in his 2008 letter to shareholders that Berkshire Hathaway has no counterparty risk in its derivative dealings because Berkshire require counterparties to make payments when contracts are initiated, so that Berkshire always holds the money. Berkshire Hathaway was a large owner of Moody's stock during the period that it was one of two primary rating agencies for subprime CDOs, a form of mortgage security derivative dependent on the use of credit default swaps. The monoline insurance companies got involved with writing credit default swaps on mortgage-backed CDOs. Some media reports have claimed this was a contributing factor to the downfall of some of the monolines. In 2009 one of the monolines, MBIA, sued Merrill Lynch, claiming that Merrill had misrepresented some of its CDOs to MBIA in order to persuade MBIA to write CDS protection for those CDOs. During the 2008 financial crisis, counterparties became subject to a risk of default, amplified with the involvement of Lehman Brothers and AIG in a very large number of CDS transactions. This is an example of systemic risk, risk which threatens an entire market, and a number of commentators have argued that size and deregulation of the CDS market have increased this risk. For example, imagine if a hypothetical mutual fund had bought some Washington Mutual corporate bonds in 2005 and decided to hedge their exposure by buying CDS protection from Lehman Brothers. After Lehman's default, this protection was no longer active, and Washington Mutual's sudden default only days later would have led to a massive loss on the bonds, a loss that should have been insured by the CDS. There was also fear that Lehman Brothers and AIG's inability to pay out on CDS contracts would lead to the unraveling of complex interlinked chain of CDS transactions between financial institutions. So far this does not appear to have happened, although some commentators[who?] have noted that because the total CDS exposure of a bank is not public knowledge, the fear that one could face large losses or possibly even default themselves was a contributing factor to the massive decrease in lending liquidity during September/October 2008. Chains of CDS transactions can arise from a practice known as "netting". Here, company B may buy a CDS from company A with a certain annual premium, say 2%. If the condition of the reference company worsens, the risk premium rises, so company B can sell a CDS to company C with a premium of say, 5%, and pocket the 3% difference. However, if the reference company defaults, company B might not have the assets on hand to make good on the contract. It depends on its contract with company A to provide a large payout, which it then passes along to company C.
The problem lies if one of the companies in the chain fails, creating a "domino effect" of losses. For example, if company A fails, company B will default on its CDS contract to company C, possibly resulting in bankruptcy, and company C will potentially experience a large loss due to the failure to receive compensation for the bad debt it held from the reference company. Even worse, because CDS contracts are private, company C will not know that its fate is tied to company A; it is only doing business with company B. As described above, the establishment of a central exchange or clearing house for CDS trades would help to solve the "domino effect" problem, since it would mean that all trades faced a central counterparty guaranteed by a consortium of dealers. The U.S federal income tax treatment of CDS is uncertain (Nirenberg and Kopp 1997:1, Peaslee & Nirenberg 2008-07-21:129 and Brandes 2008). [notes 2] Commentators have suggested that, depending on how they are drafted, they are either notional principal contracts or options for tax purposes,(Peaslee & Nirenberg 2008-07-21:129). but this is not certain. There is a risk of having CDS recharacterized as different types of financial instruments because they resemble put options and credit guarantees. In particular, the degree of risk depends on the type of settlement (physical/cash and binary/FMV) and trigger (default only/any credit event) (Nirenberg & Kopp 1997:8). And, as noted below, the appropriate treatment for Naked CDS may be entirely different. If a CDS is a notional principal contract, pre-default periodic and nonperiodic payments on the swap are deductible and included in ordinary income. If a payment is a termination payment, or a payment received on a sale of the swap to a third party, however, its tax treatment is an open question. In 2004, the Internal Revenue Service announced that it was studying the characterization of CDS in response to taxpayer confusion. As the outcome of its study, the IRS issued proposed regulations in 2011 specifically classifying CDS as notional principal contracts, and thereby qualifying such termination and sale payments for favorable capital gains tax treatment. These proposed regulations—which are yet to be finalized—have already been subject to criticism at a public hearing held by the IRS in January 2012, as well as in the academic press, insofar as that classification would apply to Naked CDS. The thrust of this criticism is that Naked CDS are indistinguishable from gambling wagers, and thus give rise in all instances to ordinary income, including to hedge fund managers on their so-called carried interests, and that the IRS exceeded its authority with the proposed regulations. This is evidenced by the fact that Congress confirmed that certain derivatives, including CDS, do constitute gambling when, in 2000, to allay industry fears that they were illegal gambling, it exempted them from “any State or local law that prohibits or regulates gaming.” While this decriminalized Naked CDS, it did not grant them relief under the federal gambling tax provisions. The accounting treatment of CDS used for hedging may not parallel the economic effects and instead, increase volatility. For example, GAAP generally require that CDS be reported on a mark to market basis. In contrast, assets that are held for investment, such as a commercial loan or bonds, are reported at cost, unless a probable and significant loss is expected. Thus, hedging a commercial loan using a CDS can induce considerable volatility into the income statement and balance sheet as the CDS changes value over its life due to market conditions and due to the tendency for shorter dated CDS to sell at lower prices than longer dated CDS. One can try to account for the CDS as a hedge under FASB 133 but in practice that can prove very difficult unless the risky asset owned by the bank or corporation is exactly the same as the Reference Obligation used for the particular CDS that was bought. A new type of default swap is the "loan only" credit default swap (LCDS). This is conceptually very similar to a standard CDS, but unlike "vanilla" CDS, the underlying protection is sold on syndicated secured loans of the Reference Entity rather than the broader category of "Bond or Loan". Also, as of May 22, 2007, for the most widely traded LCDS form, which governs North American single name and index trades, the default settlement method for LCDS shifted to auction settlement rather than physical settlement. The auction method is essentially the same that has been used in the various ISDA cash settlement auction protocols, but does not require parties to take any additional steps following a credit event (i.e., adherence to a protocol) to elect cash settlement. On October 23, 2007, the first ever LCDS auction was held for Movie Gallery. Because LCDS trades are linked to secured obligations with much higher recovery values than the unsecured bond obligations that are typically assumed the cheapest to deliver in respect of vanilla CDS, LCDS spreads are generally much tighter than CDS trades on the same name. ^ Intercontinental Exchange's closest rival as credit default swaps (CDS) clearing houses, CME Group (CME) cleared $192 million in comparison to ICE's $10 trillion (Terhune Bloomberg Business Week 2010-07-29). ^ The link is to an earlier version of this paper. ^ Azad, C (April 10, 2013). "CDOs Are Back: Will They Lead to Another Financial Crisis". University of Pennsylvania. Wharton. Retrieved January 31, 2018. ^ a b Simkovic, Michael, "Leveraged Buyout Bankruptcies, the Problem of Hindsight Bias, and the Credit Default Swap Solution", Columbia Business Law Review (Vol. 2011, No. 1, pp. 118), 2011. ^ Pollack, Lisa (January 5, 2012). "Credit event auctions: Why do they exist?". FT Alphaville. Retrieved January 5, 2012. ^ a b c d "Chart; ISDA Market Survey; Notional amounts outstanding at year-end, all surveyed contracts, 1987–present" (PDF). International Swaps and Derivatives Association (ISDA). Archived from the original (PDF) on March 23, 2012. Retrieved April 8, 2010. ^ ISDA 2010 MID-YEAR MARKET SURVEY Archived September 13, 2011, at the Wayback Machine. Latest available a/o 2012-03-01. ^ "ISDA: CDS Marketplace :: Market Statistics". Isdacdsmarketplace.com. December 31, 2010. Retrieved March 12, 2012. ^ a b c d Kiff, John; Jennifer Elliott; Elias Kazarian; Jodi Scarlata; Carolyne Spackman (November 2009). "Credit Derivatives: Systemic Risks and Policy Options" (PDF). International Monetary Fund: IMF Working Paper (WP/09/254). Retrieved April 25, 2010. ^ a b c d e f g h i j k l m n Weistroffer, Christian; Deutsche Bank Research (December 21, 2009). "Credit default swaps: Heading towards a more stable system" (PDF). Deutsche Bank Research: Current Issues. Retrieved April 15, 2010. ^ a b Simkovic, Michael, Secret Liens and the Financial Crisis of 2008. ^ a b c d e Sirri, Erik, Director, Division of Trading and Markets U.S. Securities and Exchange Commission. "Testimony Concerning Credit Default Swaps Before the House Committee on Agriculture October 15, 2008". Retrieved April 2, 2010. ^ a b c d e Partnoy, Frank; David A. Skeel, Jr. (2007). "The Promise And Perils of Credit Derivatives". University of Cincinnati Law Review. 75: 1019–1051. SSRN 929747. ^ "Media Statement: DTCC Policy for Releasing CDS Data to Global Regulators". Depository Trust & Clearing Corporation. March 23, 2010. Archived from the original on April 29, 2010. Retrieved April 22, 2010. ^ a b c Koresh, Galil; Shapir, Offer Moshe; Amiram, Dan; Ben-Zion, Uri (November 1, 2018). "The Determinants of CDS Spreads". journal of banking and finance. 41: 271–282. Retrieved November 1, 2018. ^ Michael Simkovic (2016). Adler, Barry (ed.). Making Fraudulent Transfer Law More Predictable, in Handbook on Corporate Bankruptcy. Edward Elgar. SSRN 2775920. ^ a b c d e f g h i j Mengle, David. "Credit Derivatives: An Overview" (PDF). Economic Review (FRB Atlanta), Fourth Quarter 2007. 92 (4). Retrieved January 13, 2016. ^ a b c d Federal Reserve Bank of Atlanta (April 14, 2008). "Did You Know? A Primer on Credit Default Swaps". Financial Update. 21 (2). Archived from the original on July 23, 2011. Retrieved March 31, 2010. ^ a b Kopecki, Dawn; Shannon D. Harrington (July 24, 2009). "Banning 'Naked' Default Swaps May Raise Corporate Funding Costs". Bloomberg. Retrieved March 31, 2010. ^ a b c d e f g h Leonard, Andrew (April 20, 2010). "Credit default swaps: What are they good for?". Salon.com. Salon Media Group. Retrieved April 24, 2010. ^ CFA Institute. (2008). Derivatives and Alternative Investments. pg G-11. Boston: Pearson Custom Publishing. ISBN 0-536-34228-8. ^ Cox, Christopher, Chairman, U.S. Securities and Exchange Commission. "Testimony Concerning Turmoil in U.S. Credit Markets: Recent Actions Regarding Government Sponsored Entities, Investment Banks and Other Financial Institutions". Senate Committee on Banking, Housing, and Urban Affairs. September 23, 2008. Retrieved March 17, 2009. ^ Morgenson, Gretchen (August 10, 2008). "Credit default swap market under scrutiny". Retrieved November 3, 2008. If a default occurs, the party providing the credit protection — the seller — must make the buyer whole on the amount of insurance bought. ^ Frielink, Karel (August 10, 2008). "Are credit default swaps insurance products?". Retrieved November 3, 2008. If the fund manager acts as the protection seller under a CDS, there is some risk of breach of insurance regulations for the manager.... There is no Netherlands Antilles case law or literature available which makes clear whether a CDS constitutes the ‘conducting of insurance business’ under Netherlands Antilles law. However, if certain requirements are met, credit derivatives do not qualify as an agreement of (non-life) insurance because such an arrangement would in those circumstances not contain all the elements necessary to qualify it as such. ^ "Understanding Derivatives: Markets and Infrastructure - Federal Reserve Bank of Chicago". chicagofed.org. ^ Kramer, Stefan (April 20, 2010). "Do We Need Central Counterparty Clearing of Credit Default Swaps?" (PDF). Retrieved April 3, 2011. ^ a b c Gensler, Gary, Chairman Commodity Futures Trading Commission (March 9, 2010). "Keynote Address of Chairman Gary Gensler, OTC Derivatives Reform, Markit's Outlook for OTC Derivatives Markets Conference" (PDF). Archived from the original (PDF) on May 27, 2010. Retrieved April 25, 2010. ^ "Surveys & Market Statistics". International Swaps and Derivatives Association (ISDA). Archived from the original on April 14, 2010. Retrieved April 20, 2010. ^ "Regular OTC Derivatives Market Statistics". Bank for International Settlements. Retrieved April 20, 2010. ^ "Trade Information Warehouse Reports". Depository Trust & Clearing Corporation (DTCC). Archived from the original on April 29, 2010. Retrieved April 20, 2010. ^ "S&P Capital IQ Announces Acquisition of Credit Market Analysis Limited". S&P Capital IQ. Retrieved July 2, 2012. ^ "The Trade Information Warehouse (Warehouse) is the market's first and only centralized global repository for trade reporting and post-trade processing of OTC credit derivatives contracts". Depository Trust & Clearing Corporation. Archived from the original on November 13, 2007. Retrieved April 23, 2010. ^ "Publications: OCC's Quarterly Report on Bank Derivatives Activities". Office of the Comptroller of the Currency. Retrieved April 20, 2010. ^ a b Lucas, Douglas; Laurie S. Goodman; Frank J. Fabozzi (May 5, 2006). Collateralized Debt Obligations: Structures and Analysis, 2nd Edition. John Wiley & Sons Inc. p. 221. ISBN 978-0-471-71887-1. ^ "SEC charges Goldman Sachs with fraud in subprime case". USA Today. April 16, 2010. Retrieved April 27, 2010. ^ a b c d e f Litan, Robert E. (April 7, 2010). "The Derivatives Dealers' Club and Derivatives Markets Reform: A Guide for Policy Makers, Citizens and Other Interested Parties" (PDF). Brookings Institution. Archived from the original (PDF) on December 22, 2010. Retrieved April 15, 2010. ^ a b c Buiter, Willem (March 16, 2009). "Should you be able to sell what you do not own?". Financial Times. Retrieved April 25, 2010. ^ Munchau, Wolfgang. "Time to outlaw naked credit default swaps". Financial Times. Retrieved April 24, 2010. ^ Leopold, Les (June 2, 2009). The Looting of America: How Wall Street's Game of Fantasy Finance Destroyed Our Jobs, Our Pensions, and Prosperity, and What We Can Do About It. Chelsea Green Publishing. ISBN 978-1-60358-205-6. Retrieved April 24, 2010. ^ Soros, George (March 24, 2009). "Opinion: One Way to Stop Bear Raids". Wall Street Journal. Retrieved April 24, 2010. ^ a b Moshinsky, Ben; Aaron Kirchfeld (March 11, 2010). "Naked Swaps Crackdown in Europe Rings Hollow Without Washington". Bloomberg. Retrieved April 24, 2010. ^ a b c Jacobs, Stevenson (March 10, 2010). "Greek Debt Crisis Is At The Center Of The Credit Default Swap Debate". Huffington Post. Retrieved April 24, 2010. ^ "E.U. Derivatives Ban Won't Work, U.S. Says". New York Times. March 17, 2010. Retrieved April 24, 2010. ^ Kern, Steffen; Deutsche Bank Research (March 17, 2010). "Short Selling" (PDF). Research Briefing. Retrieved April 24, 2010. ^ "Greece Govt Bond 10 Year Acting as Benchmark". Bloomberg.com. March 8, 2012. Retrieved March 12, 2012. ^ "Bill H.R. 977". govtrack.us. Retrieved March 15, 2011. ^ a b "OCC 96-43; OCC Bulletin; Subject: Credit Derivatives; Description: Guidelines for National Banks" (txt). Office of the Comptroller of the Currency. August 12, 1996. Retrieved April 8, 2010. ^ a b c McDermott, Robert. "The Long Awaited Arrival of Credit Derivatives". Derivatives Strategy, December/January 1997. Archived from the original on January 18, 2017. Retrieved April 8, 2010. ^ Miller, Ken (Spring 2009). "Using Letters Of Credit, Credit Default Swaps And Other Forms of Credit Enhancements in Net Lease Transactions" (PDF). Virginia Law & Business Review. 4 (1): 69–78, 80. Archived from the original (PDF) on July 28, 2011. Retrieved April 15, 2010. the use of an exotic credit default swap (called a Net Lease CDS), which effectively hedges tenant credit risk but at a substantially higher price than a vanilla swap. ^ "Archived copy" (PDF). Archived from the original (PDF) on June 26, 2010. Retrieved 2016-02-08. CS1 maint: Archived copy as title (link) Chatiras, Manolis, and Barsendu Mukherjee. Capital Structure Arbitrage: Investigation using Stocks and High Yield Bonds. Amherst, MA: Center for International Securities and Derivatives Markets, Isenberg School of Management, University of Massachusetts, Amherst, 2004. Retrieved March 17, 2009. ^ a b Smithson, Charles; David Mengle (Fall 2006). "The Promise of Credit Derivatives in Nonfinancial Corporations (and Why It's Failed to Materialize)" (PDF). Journal of Applied Corporate Finance. 18 (4): 54–60. doi:10.1111/j.1745-6622.2006.00111.x. Archived from the original (PDF) on July 15, 2011. Retrieved April 8, 2010. ^ a b c d e Tett, Gillian (2009). Fool's Gold: How Unrestrained Greed Corrupted a Dream, Shattered Global Markets and Unleashed a Catastrophe. Little Brown. pp. 48–67, 87, 303. ISBN 978-0-349-12189-5. ^ a b c Philips, Matthew (September 27, 2008). "The Monster That Ate Wall Street". Newsweek. Retrieved April 7, 2010. ^ Lanchester, John (June 1, 2009). "Outsmarted". New Yorker. Retrieved April 7, 2010. ^ a b Tett, Gillian. "The Dream Machine: Invention of Credit Derivatives". Financial Times. March 24, 2006. Retrieved March 17, 2009. ^ Alex Chambers (May 1, 2006). "How the structured credit revolution started". Euromoney. ^ Simon, Ellen (October 20, 2008). "Meltdown 101: What are credit default swaps?". USA Today. Retrieved April 7, 2010. ^ "Remarks by Chairman Alan Greenspan Risk Transfer and Financial Stability To the Federal Reserve Bank of Chicago's Forty-first Annual Conference on Bank Structure, Chicago, Illinois (via satellite) May 5, 2005". Federal Reserve Board. May 5, 2005. Retrieved April 8, 2010. ^ McDermott, Robert. "The Long Awaited Arrival of Credit Derivatives, December–January 1997". Derivatives Strategy. Archived from the original on January 18, 2017. Retrieved April 8, 2010. The lack of standardized documentation for credit swaps, in fact, could become a major brake on market expansion. ^ a b Ranciere, Romain G. (April 2002). "Credit Derivatives in Emerging Markets" (PDF). IMF Policy Discussion Paper. Archived from the original (PDF) on June 23, 2010. Retrieved April 8, 2010. ^ "ISDA Market Survey, Year-End 2008". Isda.org. Archived from the original on August 17, 2010. Retrieved August 27, 2010. ^ Atlas, Riva D. (September 16, 2005). "Trying to Put Some Reins on Derivatives". New York Times. Retrieved April 8, 2010. ^ Weithers, Tim. "Credit Derivatives, Macro Risks, and Systemic Risks" (PDF). Economic Review (FRB Atlanta), Fourth Quarter 2007. 92 (4): 43–69. Archived from the original (PDF) on July 23, 2011. Retrieved April 9, 2010. ^ "The level of outstanding credit-derivative trade confirmations presents operational and legal risks for firms" (PDF). Financial Risk Outlook 2006. The Financial Services Authority. Retrieved April 8, 2010. ^ "Default Rates". Efalken.com. Retrieved August 27, 2010. ^ a b Colin Barr (March 16, 2009). "The truth about credit default swaps". CNN / Fortune. Retrieved March 27, 2009. ^ "Bad news on Lehman CDS". Ft.com. October 11, 2008. Retrieved August 27, 2010. ^ href=\, <a. "Buffett's". reuters.com. ^ "Testimony Concerning Turmoil in U.S. Credit Markets: Recent Actions Regarding Government Sponsored Entities, Investment Banks and Other Financial Institutions (Christopher Cox, September 23, 2008)". Sec.gov. September 23, 2008. Retrieved August 27, 2010. ^ Bowers, Simon (November 5, 2008). "Banks hit back at derivatives criticism". The Guardian. London. Retrieved April 30, 2010. ^ Harrington, Shannon D. (November 5, 2008). "Credit-Default Swaps on Italy, Spain Are Most Traded (Update1)". Bloomberg. Retrieved August 27, 2010. ^ "DTCC " DTCC Deriv/SERV Trade Information Warehouse Reports". Dtcc.com. Archived from the original on December 12, 2009. Retrieved August 27, 2010. ^ a b c Chad Terhune (July 29, 2010). "ICE's Jeffrey Sprecher: The Sultan of Swaps". Bloomberg Business Week. Retrieved February 15, 2013. ^ a b c Robert E. Litan (April 7, 2010). "The Derivatives Dealers' Club and Derivatives Markets Reform: A Guide for Policy Makers, Citizens and Other Interested Parties" (PDF). Brookings Institution. Archived from the original (PDF) on May 28, 2013. ^ a b c "IntercontinentalExchange gets SEC exemption: The exchange will begin clearing credit-default swaps next week". Bloomberg News. March 7, 2009. ^ Van Duyn, Aline. "Worries Remain Even After CDS Clean-Up". The Financial Times. Retrieved March 12, 2009. ^ Monetary and Economic Department. "OTC derivatives market activity in the first half of 2011" (PDF). Bank for International Settlements. Retrieved December 15, 2011. ^ a b "Report Center - Data". ICE. Retrieved March 12, 2012. ^ Leising, Matthew; Harrington, Shannon D (March 6, 2009). "Intercontinental to Clear Credit Swaps Next Week". Bloomberg. Retrieved March 12, 2009. ^ Zuckerman, Gregory; Burne, Katy (April 6, 2012). "'London Whale' Rattles Debt Market". The Wall Street Journal. ^ Azam Ahmed (May 15, 2012). "As One JPMorgan Trader Sold Risky Contracts, Another One Bought Them". The New York Times. Retrieved May 16, 2012. ^ Katy Burne (April 10, 2012). "Making Waves Against 'Whale'". The Wall Street Journal. Retrieved May 16, 2012. ^ Farah Khalique (May 11, 2012). "Chart of the Day: London Whale trading". Financial News. Retrieved May 16, 2012. ^ "Crony Capitalism: After Lobbying Against New Financial Regulations, JPMorgan Loses $2B in Risky Bet". Democracy Now!. May 15, 2012. Retrieved May 16, 2012. ^ Jessica Silver-Greenberg; Peter Eavis (May 10, 2012). "JPMorgan Discloses $2 Billion in Trading Losses". The New York Times. Retrieved May 16, 2012. ^ "2003 Credit Derivatives Definitions". Isda.org. Archived from the original on August 29, 2010. Retrieved August 27, 2010. ^ "Euro-Parliament bans "naked" Credit Default Swaps". EUbusiness. November 16, 2011. Retrieved November 26, 2011. ^ "Risk.Net :: Special Report". Archived from the original on September 29, 2007. ^ "Settlement Auction for Lehman CDS: Surprises Ahead?". Seeking Alpha. October 10, 2008. Retrieved August 27, 2010. ^ "In depth: Fed to hold CDS clearance talks". Ft.com. Retrieved August 27, 2010. ^ a b "Isda Ceo Notes Success Of Lehman Settlement, Addresses Cds Misperceptions". Isda.org. October 21, 2008. Archived from the original on December 13, 2010. Retrieved August 27, 2010. ^ Salmon, Felix (March 1, 2012). "How Greece's Default Could Kill The Sovereign CDS Market". Seeking Alpha. Retrieved March 1, 2012. ^ Watts, William L., "No Greek CDS payout on swap, panel says", MarketWatch, March 1, 2012. Retrieved 2012-03-01. ^ Markit. Tradeable Credit Fixings. Retrieved 2008-10-28. ^ "Year Credit Event Fixing". www.creditfixings.com. Retrieved January 26, 2017. ^ "Gannett and the Side Effects of Default Swaps". The New York Times. June 23, 2009. Retrieved July 14, 2009. ^ "Protecting GM from Credit Default Swap Holders". Firedoglake. May 14, 2009. Retrieved July 14, 2009. ^ a b "/ Financials — Lehman CDS pay-outs higher than expected". Ft.com. October 10, 2008. Retrieved August 27, 2010. ^ "Daily Brief". October 28, 2008. Archived from the original on January 11, 2009. Retrieved November 6, 2008. ^ Buffett, Warren (February 21, 2003). "Berkshire Hathaway Inc. Annual Report 2002" (PDF). Berkshire Hathaway. Retrieved September 21, 2008. ^ Olsen, Kim Asger, "Pay-up time for Lehman swaps", atimes.com, October 22, 2008. ^ Holm, Erik (November 21, 2008). "Berkshire Asked by SEC in June for Derivative Data (Update1)". Bloomberg. Retrieved August 27, 2010. ^ Buffett, Warren. "Berkshire Hathaway Inc. Annual Report 2008" (PDF). Berkshire Hathaway. Retrieved December 21, 2009. ^ Ambac, MBIA Lust for CDO Returns Undercut AAA Success (Update2) , Christine Richard, bloomberg, jan 22, 2008. Retrieved 2010 4 29. ^ Credit Default Swaps: Monolines faces litigious and costly endgame, Aug 2008, Louise Bowman, euromoney.com. Retrieved 2010 4 29. ^ Supreme Court of New York County (April 2009). "MBIA Insurance Co. v Merrill Lynch" (PDF). mbia.com. Archived from the original (PDF) on December 18, 2010. Retrieved April 23, 2010. ^ MBIA Sues Merrill Lynch , Wall Street Journal, Serena Ng, 2009 May 1. Retrieved 2010 4 23. ^ Investing Daily (September 16, 2008). "AIG, the Global Financial System and Investor Anxiety". Kciinvesting.com. Archived from the original on February 10, 2009. Retrieved August 27, 2010. ^ Unregulated Credit Default Swaps Led to Weakness. All things Considered, National Public Radio. Oct 31, 2008. ^ a b Nirenberg, David Z.; Steven L. Kopp. (August 1997). "Credit Derivatives: Tax Treatment of Total Return Swaps, Default Swaps, and Credit-Linked Notes". Journal of Taxation. ^ a b Peaslee, James M.; David Z. Nirenberg (November 26, 2007). "Federal Income Taxation of Securitization Transactions: Cumulative". Supplement No. 7: 83. Retrieved July 28, 2008. ^ Peaslee & Nirenberg, 89. ^ I.R.S. REG-111283-11, IRB 2011-42 (Oct. 17, 2011). ^ Diane Freda, I.R.S. Proposed Rules Mistakenly Classify Section 1256 Contracts, I.R.S. Witnesses Say, DAILY TAX REP. (BNA) No. 12 at G-4 (Jan. 20, 2012). ^ a b James Blakey, Tax Naked Credit Default Swaps for What They Are: Legalized Gambling, 8 U. Mass. L. Rev. 136 (2013). ^ See Hearing to Review the Role of Credit Derivatives in the U.S. Economy, Before H. Comm. on Agriculture, at 4 (Nov. 20, 2008) (statement of Eric Dinallo, Superintendent of New York State Ins. Dept.) (declaring that "[w]ith the proliferation of various kinds of derivatives in the late 20th Century came legal uncertainty as to whether certain derivatives, including credit default swaps, violated state bucket shop and gambling laws. [The Commodity Futures Modernization Act of 2000] created a ‘safe harbor’ by . . . preempting state and local gaming and bucket shop laws . . .") available at http://www.dfs.ny.gov/about/speeches_ins/sp0811201.pdf[permanent dead link]. ^ Commodity Futures Modernization Act of 2000, H.R. 5660, 106th Cong. § 117(e)(2). ^ "FASB 133". Fasb.org. June 15, 1999. Retrieved August 27, 2010. Look up credit default swap in Wiktionary, the free dictionary. "Systemic Counterparty Confusion: Credit Default Swaps Demystified". Derivative Dribble. October 23, 2008. BIS - Regular Publications. Bank for International Settlements. "A billion-dollar game for bond managers". Financial Times. Duffie, Darrell. "Credit Swap Valuation". Stanford Graduate School of Business. CiteSeerX 10.1.1.139.4044. John C. Hull and Alan White. "Valuing Credit Default Swaps I: No Counterparty Default Risk". University of Toronto. Demystifying the Credit Crunch. Private Equity Council. "The AIG Bailout" William Sjostrom, Jr.
Pulliam, Susan and Ng, Serena (January 18, 2008), Wall Street Journal: "Default Fears Unnerve Markets"
Das, Satayjit (February 5, 2008), Financial Times: "CDS market may create added risks"
Morgenson, Gretchen (February 17, 2008), New York Times: "Arcane Market is Next to Face Big Credit Test"
Schwartz, Nelson D. and Creswell, Julie (March 23, 2008), New York Times: "Who Created This Monster?" Evans, David (May 20, 2008), Bloomberg: "Hedge Funds in Swaps Face Peril With Rising Junk Bond Defaults"
van Duyn, Aline (May 28, 2008), Financial Times: "Moody's issues warning on CDS risks"
Morgenson, Gretchen (June 1, 2008), New York Times: "First Comes the Swap. Then It’s the Knives." Kelleher, James B. (September 18, 2008), Reuters: "Buffett's 'time bomb' goes off on Wall Street." Morgenson, Gretchen (September 27, 2008), New York Times: "Behind Insurer’s Crisis, Blind Eye to a Web of Risk"
Varchaver, Nicholas and Benner, Katie (Sep 2008), Fortune Magazine: "The $55 Trillion Question" - on CDS spotlight during financial crisis. Dizard, John (October 23, 2006). "A billion dollar game". Financial Times. Archived from the original on April 6, 2009. Retrieved October 19, 2008. October 19, 2008, Portfolio.com: "Why the CDS Market Didn't Fail" Analyzes the CDS market's performance in the Lehman Bros. bankruptcy. Boumlouka, Makrem (April 8, 2009), Wall Street Letter: "Credit Default Swap Market: "Big Bang"? [permanent dead link]".